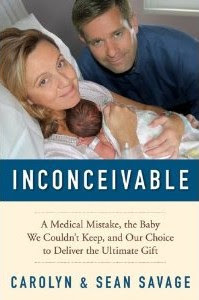 I was asked if I'd like to read a copy of Inconceivable : A Medical Mistake, the Baby We Couldn't Keep, and Our Choice to Deliver the Ultimate Gift. I vaguely recalled their story from news articles I read at the time that it was discovered that a fertility clinic implanted the wrong embryo into Carolyn Savage during what should have been a "routine" IVF procedure back in February 2009. The Savage family, upon discovering the mistake, decided against aborting the child - even though it was not their own - and decided to give it life instead. Furthermore, they opted not to engage in any type of custody battle but decided to turn the child over upon birth to the biological parents. This book is their story of hopeful anticipation, heart ache, despair, sacrifice and joyful pain. I'm not here to debate the issue of IVF - just to talk about the book and the Savage's story. Carolyn, Sean and their family are Catholic and the Catholic church is opposed to the idea of IVF, but Carolyn and Sean felt that their desire to have a family was a godly endeavor. They had always dreamed of having a large family but Carolyn had infertility issues which made conceiving quite difficult. Although they did end up having two sons in the natural way, their young daughter was born as a result of IVF. They longed to have at least four children and despite Carolyn's difficulty in child bearing and delivery, they opted to try for one more. Carolyn was 40 years old when the embryos were implanted in her and it was devastating to them to receive the phone call that they were indeed pregnant, but not with their own child. Their last chance at being pregnant and having a fourth child was now beyond them and instead of getting to birth and welcome a child into their home and family, they had to birth a child and give it away. I read this book when I was weeks away from delivering my own daughter (and I'm actually writing up this review while still pregnant - even though it will not post until after the fact.) I personally cannot fathom carrying a child and then having to give it up. As an adoptive mother, I cannot imagine what emotions the birth mother of my son did and has experienced since saying goodbye to her first born. She doesn't know where he is every day or what he's doing. She has no idea how he is developing or what his personality is like. She carried him for nine months only to give him up into an unknown situation. Were I her, I don't know that I would deal with it very well. I have a hard time envisioning birthing a daughter only to have her rolled out of the room and placed into someone else's arms. It makes me heartsick to think about it! It made me heartsick for the Savages (especially Carolyn) to read this book. Maybe this was the right time for me to read this book. Maybe it was the wrong time. Regardless, I was enthralled with their honesty, raw emotions and even their joy in knowing that - regardless of their own pain - they were giving the gift of life to a precious human being. We are always very ready to bless the Lord and thank Him for the things we perceive as being "good" in our lives, aren't we? A bonus at work? Praise the Lord! Health? Hallelujah! A houseful of children that we desperately wanted? AMEN! When the hard times we are more apt to want to respond as Job's wife did - with denials of God's goodness. His ways are NOT our ways and our thoughts are NOT our thoughts. (Isaiah 55:8) What we forget is that God's plan is better than ours and while we might not understand it, we should still praise Him in the darkest storm. We are more than conquerors in Him and nothing can separate us from His love (Romans 8:31-39) - not even what appears to be a bad situation. Now, I am certainly not discounting the Savages pain. It runs very deep. As they pointed out, giving up the baby at birth is like experiencing a death. I know that even in our own adoption story we "lost" our first referral when the foster mother decided to adopt the child herself. We had connected with the child and it was devastating to have this child who was already in our hearts ripped away from us. It felt like a death. And the child wasn't even inside of me! I simply cannot fathom the depths of what they felt. However, I do think it's important not to deny the sovereign goodness of God and perfection of Who He Is. It is not healthy, beneficial or in any way theologically accurate. We wound ourselves further when we shove God away and say, "YOU wouldn't do this to me so I don't think I can talk to you about (fill in the blank)! CLEARLY someone messed up. You are not in this." God has to be in things. Without God's involvement, I can only imagine feeling like I was in the depths of despair. I am certainly not discounting their feelings or emotions - just saying that their view of God cost them peace which passes human understanding which would be terrifying to me, were I in their position. That all said, I also feel equally sympathetic towards them. Carrying a baby to term was something that Carolyn had a difficulty doing in the past and it made me feel a little guilty to read her book and know that my baby was sitting tight (not wanting to come out apparently!) because everything was healthy and going "as planned." Reading this when healthily pregnant, knowing I was going to be able to hold my baby and keep her afterwards, caused a tear or two to fall. It's always interesting to hear someone else's story and learn their perspective. (Not saying I wouldn't have gone for an early c-section or something. I don't particularly enjoy pregnancy. Being honest here! Nothing has changed about the way I view my own discomfort levels!) I much prefer having a babe in arms. But the point is - I have a baby in my arms. The Savage family ended up without this joy - and their story can definitely soften one's heart! Inconceivable was a very interesting, insightful and engaging read. It is a hard read, jam packed full of emotions but also filled with the message that life is sacred and meant to be carried to term and protected. I very much appreciated that aspect and message of the book. Thank you FSB media for sending me a copy of this book to read and think about it! It was definitely an eye-opening , inspiring, and thought-provoking read. P.S. The Savages just recently gave an interview on the Today Show which you might be interested in watching, following the conclusion of their journey mentioned in this book. Wow. I had not heard of the Savage's story before. Heartache for sure...but I agree, from God. And good can certainly come from it! Oh wow, this looks fascinating! I'm sure it would be a hard read. Our children's birthmothers have experienced great heartbreak in their decisions to make adoption plans, but one thing that makes their stories different is they 1) didn't PLAN to get pregnant and 2) they weren't in committed relationships with the emotional, financial, etc. support to raise a child. For the Savage family who were trying to have a baby. . .wow, I can't even imagine! And as to the theology, I appreciate the verse you quoted. Makes me think of Ann's book which I finally posted a real review of instead of just my thoughts from specific points--but she does a great job saying the same thing you're saying. Trust God, He is in control, we must joyfully accept the things our human nature doesn't like just as we accept that which we enjoy. Amen! I do feel for this family but I totally agree with you. I had not heard of this story. How tragic! I do appreciate their taking a stand for life, but I do agree with your take on it, as well. Wow! That kind of pain is incomprehensible!